Two Third Doctor Audio Adventures in a 5CD boxset, with Katy Manning as Jo, Richard Franklin as Mike Yates and Tim Treloar as the narrator. Two Third Doctor Audio Adventures in a 5CD boxset, with Katy Manning as Jo and Tim Treloar’s special rendition of the Doctor. The Transcendence of Ephros sees the travellers encounter a devious corporation picking over the remains of a dying planet, while The Hidden Realm brings the intrepid pair down to Earth, to a town of mysterious disappearances, sinister magpies and secret alien plots… Volume 2 switches up the format laid down by its predecessor, dropping Mike Yates from the line-up to focus on the relationship between the Doctor and Jo, and ditching the occasional narration of the previous volume in favour of full cast, full blooded drama. With social themes, galactic yo-yoing, Venusian Aikido and the inclusion of Jo’s cousin Stephanie, this set promises to be a mix of the traditional and the new. Two Third Doctor Audio Adventures in a 5CD boxset, with Katy Manning as Jo and Tim Treloar’s special rendition of the Doctor, featuring Robin Weaver (Black Mirror), Iain Batchelor (Wolf Hall) and Nicholas Briggs as the Daleks. Storm of the Horofax sees the Doctor and UNIT called in to investigate an alien ship found in the North Sea, while The Conquest of Far pits the Doctor against his oldest enemies on a human colony now under Dalek control. Pairing an earthbound UNIT adventure with a futuristic sci-fi tale means this 5CD set captures the essence of the Third Doctor era whilst also giving it a new lease of life. Treloar’s performance has always been a respectful tribute to the Third Doctor, and with two sets already under his belt his rendition is now honed to a remarkable level of precision. 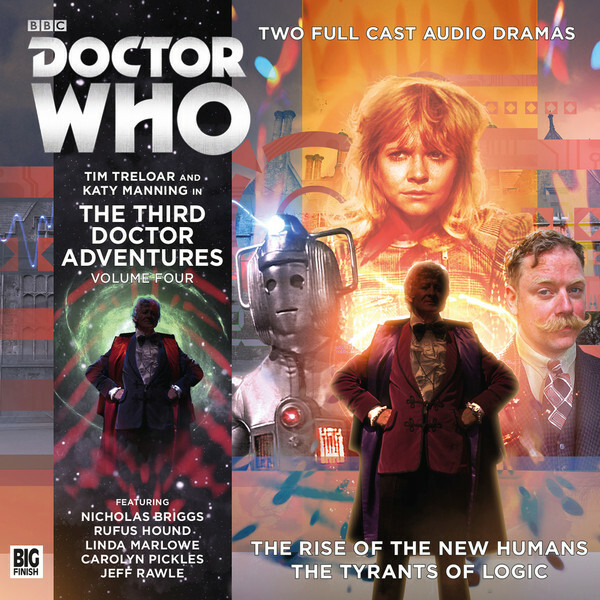 Two Third Doctor Audio Adventures in a 5CD boxset, with Katy Manning as Jo and Tim Treloar’s special rendition of the Doctor, featuring Rufus Hound (Doctor Who: The Woman Who Lived), Carolyn Pickles (Broadchurch) and Nicholas Briggs as the Cybermen. The Rise of the New Humans, alien technology in a remote hospital leads the Doctor to suspect the interference of an old Time Lord rival, while the Tyrants of Logic sees the Doctor and Jo arrive at an abandoned mining colony that holds the key to the resurgence of the Cyber Empire… Aside from a return appearance of the Meddling Monk, this set boasts the Third Doctor encountering the Cybermen – something never seen on screen – in a script from acclaimed Cyberscribe Marc Platt (Spare Parts, The Silver Turk). According to Katy Manning, Treloar’s Third Doctor improves with every release, so by now his ability to capture the soul of Pertwee’s performance is absolutely extraordinary.